India had to give more than it gained in the trade deal clinched at WTO's Bali meet. The first impression that the Bali deal gives is that India has done pretty well in the negotiations. It suits the government to create the impression that it has been a great victory for India and we got what we wanted. But I think a much deeper study is called for. Whatever sketchy details have become available show that it is not such a great deal after all. As far as food subsidies are concerned, they had a 'peace clause' which was supposed to last four years as an interim arrangement. Now, we are claiming that we have not accepted the fouryear limit and therefore we can breach the 10 per cent subsidy limit as and when necessary. The point is that the next ministerial is due after four years. All the arrangements which we have entered into in the Bali ministerial will automatically come up for review in the next meet. So, it is four years whether we like it or not. It is not indefinite. 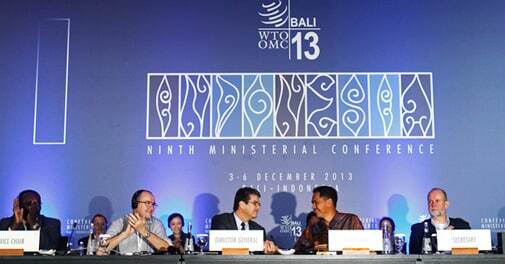 Secondly, trade facilitation and food subsidy were the two main issues at the Bali ministerial. The developed countries were very keen to get trade facilitation through and they have got what they wanted. They are very happy. We are also projecting it as being of great help to India because trade facilitation will lead to an incremental global trade of $1 trillion over a period of time. In most of the countries we export to there is already much-easier trade facilitation available. In India, we will have to go for a lot of legislative action to implement trade facilitation. We have export and import control rules. If you look at the Morocco meeting and the negotiations in the Montreal, Uruguay and Doha rounds, it can be seen that the developed countries have always been pursuing their own interests very firmly. Incrementally, they have been doing two things: forcing the developing countries to accept things which are in their national interest and making the WTO all-powerful and inclusive. For instance, the inclusion of the services sector in the WTO negotiations, which India conceded in Montreal, was a major step forward for the developed countries. Under services, we have to make one concession after another. 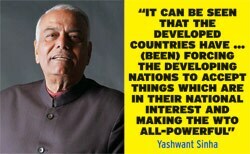 It is the developing countries which are giving up and it is the developed countries which are gaining. In trade facilitation, my reading is that the developed countries stand to gain much more than developing countries. Generally, their size of trade is much larger than ours. These are the countries which will gain rather than smaller players like India. We might be very happy that we have crossed $100 billion in terms of exports but we are still small players globally. To tout this as a major achievement, then, is incorrect. In Bali, we have ended up giving more than we gained. Then, there are a whole lot of reporting requirements on subsidies. Many people are protesting that what was always considered to be within our sovereign domain will be exposed to the international community. We will be putting to global scrutiny our agricultural subsidy programme. Remember, on the nuclear deal too we were objecting to the reporting requirements to the US Congress and the International Atomic Energy Agency. These reporting requirements make it very obtrusive. They will scrutinize the reports and act upon them. We are opening ourselves to scrutiny from which we were safe until now. The developed countries have been very clever. The point we are making before the WTO all along is that agriculture might be a livelihood issue for developed countries. For us, it is a civilisational issue. Agriculture has kept the Indian civilisation going and surviving through all vicissitudes. THE DOHA ROUND TO JUST LAPSE. THERE IS NO POINT IN SAVING IT... THE MINISTERIAL ROUNDS HAVE NOT BEEN OF ANY GREAT HELP." Exports are not merely dependent on trade facilitation. They are dependent on a number of other considerations. Therefore no one single consideration will lead to a boost in exports as many of us are asked to believe. It will depend on the state of the world economy, growth of international trade and competition in various markets. Indeed, by agreeing to trade facilitation in Bali, we have lost our last bargaining chip. Four years from now, if discussions on agricultural subsidies begin, what are we going to bargain with? We have a final deal vis-a-vis an interim deal. Even if the interim deal is in favour of India, it remains an interim deal as against the final deal on trade facilitation which the developed countries have got. My own feeling is that we should allow the Doha round to just lapse. There is no point in saving it. It was supposed to be a development round. What is development-oriented in Doha round so far? The ministerial rounds have not been of any great help. In any case, world trade will grow. Much of what we could not achieve on a multilateral basis was achieved on a bilateral basis through trade pacts and preferential trade agreements. In the WTO negotiations, the major beneficiaries are the US, European Union, Japan and China.